This is a commercial building located in Los Angeles, California. Solar Art installed decorative window film to glass in the conference room. This customer was looking for an opaque window film to allow complete privacy in the conference room, similar to how blackout window film allows 100% privacy. As you can see in the photo, frost film makes it so those in the conference room can’t see what’s going on outside and those on the outside of the conference room can’t see inside. It allows 100% privacy and confidentiality in the conference room space, which is great if you have an important meeting going on. In this case, the frosted privacy window film was installed as full coverage on the glass. Solar Art also frequently installs frosted window film as partial coverage or bands. Some customers don’t want full coverage frosted film installed because they still want some ability to see out, but they want to keep meeting topics private and confidential. In cases like this, Solar Art has installed Casper Cloaking Film, which is another decorative window film. 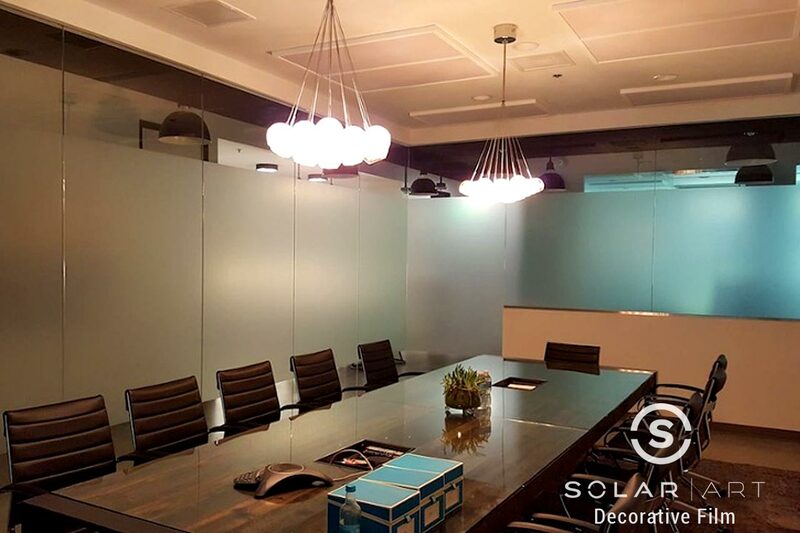 Casper Cloaking film is made by Solyx and makes it so that people outside of the conference room won’t be able to see what is being displayed on the screen during the meeting, while still allowing in some natural light from the outside! Decorative window film is applied and works the same way as solar film, security window film and anti graffiti film. It is easily removable if you decide you no longer want it, or it can easily be switched to another window film. Not only does frosted window film increase privacy, it is also a heat blocking window film, reduces the amount of glare that enters a space and blocks 99% of UVA and UVB rays. This particular job was installed to a commercial building, but decorative window film is also frequently installed in homes. It works great on a pantry or laundry room door where you are trying to hide what is behind it, or on a window where you are simply trying to create privacy from your neighbors. No matter the location or space, decorative window tint can offer several benefits! Interested in Decorative Window Film? Contact us directly to talk about decorative window film! Decorative window film provides window privacy for your home or office and comes in a variety of frosted window film shades and patterns. Contact Solar Art to learn more!